Iosif Aleksandrovich Brodsky (24 May 1940 – 28 January 1996) was a Russian-born American poet and essayist. Born in Leningrad in 1940, Brodsky ran afoul of Soviet authorities and was expelled ("strongly advised" to emigrate) from the Soviet Union in 1972, settling in the United States with the help of W. H. Auden and other supporters. He taught thereafter at Mount Holyoke College, and at universities including Yale, Columbia, Cambridge and Michigan. 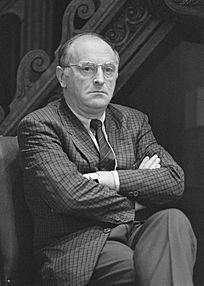 Brodsky was awarded the 1987 Nobel Prize in Literature "for an all-embracing authorship, imbued with clarity of thought and poetic intensity". He was appointed United States Poet Laureate in 1991. Brodsky died of a heart attack aged 55, at his apartment in Brooklyn Heights, a neighborhood of Brooklyn borough of New York City, on January 28, 1996. He had had open-heart surgery in 1979 and later two bypass operations, remaining in frail health since that time. He was buried in a non-Catholic section of the Isola di San Michele cemetery in Venice, Italy, also the resting place of Ezra Pound and Igor Stravinsky. In 1997, a plaque was placed on his house in St Petersburg with his portrait, and the words "In this house from 1940 to 1972 lived the great Russian poet Iosif Aleksandrovich Brodsky". Joseph Brodsky Facts for Kids. Kiddle Encyclopedia.